The biggest change that has taken place over the last several years is the adoption of eRFPs, the technology that enables planners to send their meeting requests to hotels in just a couple of clicks and magically receive complete proposals in a few hours. Or at least that’s how it was intended. The reality is that the technology that was supposed to save so much time is now the #1 reason you’re not receiving timely, complete hotel proposals. The problem with eRFP technology is that it’s made it too easy to send requests to way too many hotels. It’s not unusual today to see a single meeting sent to 40, 50 or even 90 hotels at one time. In 2010, Zentila coined a term that is now standard in the industry to describe this phenomenon: RFP SPAM. Hotel group sales offices are receiving more meeting leads than ever before. They should be happy about this, right? Wrong. Because they’re actually closing far fewer of those leads than at any time in history. As a result, hotel sales managers must sort through the pile of RFP’s and decipher between the ones that appear to be more likely to book and the ones that are just spam. We have focused several posts on how planners can get hotel sales managers' attention and help them to offer the best meeting deals. Below are summaries of all seven of these tips. Keep the total number of competing hotels down to 8 or less. This requires some work on your part to ensure that you narrow down the list of the right hotels for your meeting. (A little extra research goes a long way in eliminating hotels that probably wouldn’t work for your meeting anyway.) By reducing the competition for your hotel partner, your RFP Credibility will skyrocket. Now tell the hotels who they’re competing against. Take the credibility to a whole new level by providing the names of competing properties. That way they know how many – and exactly who – they’re competing with. Sales managers fight harder for your business when they know who they’re up against. 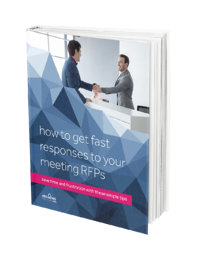 Tell your hotels when the RFP is due back to you. The due date should be no longer than 3 or 4 days, even for the largest of meetings. Any longer and you risk losing some of the energy behind the conversation that would be happening about your meeting. Be clear on the exact date the decision is going to be made. And do your best to keep it within seven to 10 days of the RFP due date. Why? The shorter the decision window, the harder the hotel will fight for your business. It’s the whole “bird in the hand” thing – they’re so close to winning your business that they’ll keep fighting to hold availability open! Communicate your decision to every hotel that responded, as soon as possible. By communicating quickly, you’re allowing sales managers to react and move on. Your RFP credibility has now run its course and you’re set for the next time you work with those hotels. Let them know both the name of the selected hotel and the reason why you selected that hotel. Salespeople are naturally driven by the competitive nature of their jobs. Letting them know they lost your meeting to the hotel next door – and why you chose that hotel – will help you when you work with them again (and you know you will because this industry is so small). They’ll know your hot buttons and will be far more focused on getting you exactly what you need next time.